Aimee Liu’s work includes the novels Flash House; Cloud Mountain; and Face, and the memoirs Gaining: The Truth About Life After Eating Disorders and Solitaire. She also has co-authored numerous psychology and business books and edited and/or contributed to many literary anthologies. Her articles have appeared in The Los Angeles Times, Ms., Cosmopolitan, Self, Glamour, The Los Angeles Review of Books and other publications. Her novels include a Literary Guild Super Release and have been published in more than twelve languages and serialized in Good Housekeeping. She’s received a Barnes & Noble Discover Great New Writers award and special mention by the Pushcart Prize. Liu is a past president of the national literary organization PEN USA and served on the board of the international Academy for Eating Disorders. A graduate of Yale College, she received her MFA in creative writing from the Bennington Writing Seminars and is a member of the faculty of Goddard College’s MFA in Creative Writing program at Port Townsend, WA. She lives in Los Angeles. The simple answer is: I write. But because I write so many different kinds of books – from literary novels to health and business books – the truth is quite a bit more complicated. I shape language to clarify ideas and form new associations, to make new meaning out of raw information and experience. I use language as a tool for discovery, both artistically and intellectually. But perhaps most important of all, I use words to build bridges of understanding and empathy. One of my strengths is my ability to distill complex stories and scientific information, to make it clear and accessible to all readers. Another is my ability to give voice to my co-authors. I’ve co-authored or ghost-written about a dozen books, and one of my favorite challenges in writing is to slip into another person’s voice and life, to help them tell their stories. Having taught writing for more than a dozen years, I’m also an excellent mentor to emerging writers. I’ve found the sweet spot, I think, between necessary honesty and genuine delight in my students’ work. When my students are ready to take their books out into the world, I’m their biggest cheerleader. I like to think that my biggest service is helping others find and raise their true voice. I have a combination of perseverance and ruthlessness that won’t let me quit. As my agent says, I’m a “finisher.” I don’t take on every project, but when I commit, I give it my all. There was a time when my perfectionism could be crippling, so that I was never satisfied, even after finishing, but I’ve learned to learn from mistakes instead of beating myself up over them. I’ve also learned that not all mistakes are actually flaws. Some mistakes turn out to be miracles, or at least happy accidents. Loosening up, trying new approaches, risking failure have all made me a better writer and a happier person. A good example resulted in my getting my MFA at 52. After my novel Flash House was published, I couldn’t find the fire to start another novel. The fear gripped me that grips all writers at various points: I was terrified I’d never write anything worthwhile again. I was already teaching in an extension program, so I thought the time had come to shift seriously into teaching. (You know, “Those who can’t, teach.”) But I had no MFA, the requirement for teaching in most accredited programs. I’d been too intimidated by grad school to consider it in my 20s. Later, I was so well published – eleven books (including co-authorships) and counting – that I felt a little embarrassed by the prospect of returning to school to “learn how to write.” But I also knew just how much I still didn’t know about literary writing, and when I learned about low-residency MFA programs, I realized I wouldn’t have to uproot my life to get my Masters. I was sold. As a cosmic reward, I then sold a proposal for my book Gaining: The Truth About Life After Eating Disorders, which I began as my MFA thesis, and this made it a vastly better book than it would have been without the literary foundation I was able to give it with help from my MFA advisors. Further proof that my persistence paid off: Before I even graduated with my MFA, I was hired by Goddard College to teach in their low-residency MFA program at a Pacific Northwest campus they were just opening. I have been teaching at Port Townsend, WA, in Goddard’s MFA in Creative Writing program ever since, and that community of writers has become a beloved second family. I am so grateful to Goddard, because teaching writing, in itself, makes me the best version of myself. My immediate goals are to see two big books – a novel and a family memoir – through to publication. Both of these are projects that began ten or more years ago. One is making the rounds of publishers now, and the other is in revision. I’m eager to find them both publishing homes so that I can turn in a new direction. I read once that Ray Bradbury never knew what he’d work on when he got up each morning. He let each day’s passion direct him. I aspire to be that relaxed about my creativity, and I’m moving in that direction. But I still labor at times under that curse word: SHOULD. It’s not a problem when I have lots of interesting projects that I MUST do, but it’s much harder to crank up between projects. So, I suppose my aspiration would be to always have at least 2 fascinating books in progress at any given time. I’d also like to master new genres – to write more short stories, to attempt a mystery novel, and just to keep finding new ways to have fun on the page. 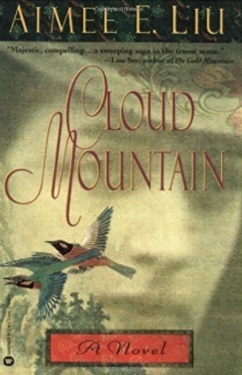 Cloud Mountain was my first big novel. There were times while writing it when I prayed, just let me finish this book before I die. The story is based on the star-crossed tale of my grandparents’ marriage. My father’s father was a Chinese scholar-revolutionary; his mother, a Kansas-born pioneer. They met in San Francisco before the 1906 earthquake, and were married just one month later. I never knew either of these grandparents, and much of their story had been lost or buried due to anti-Asian prejudice. I’d written my first novel, Face, using a few threads of their story, but Cloud Mountain was directly based not only on family accounts but also on volumes of memoirs that my grandfather had written – and which I had translated from classical Chinese. This book became an international bestseller and allowed me to pay tribute to a remarkable story of love and courage during an extraordinary period of Chinese and American history. My biggest success on a personal level is a very different story: I solved a crazy little mystery for my son when he was in second grade. To make a long story short, it was his first day at school with his retainer, which he’d obediently left in its cherry red box while he was playing ball. It disappeared, and he was beside himself when I came to pick him up. No one at school could find it. I deduced that another kid had taken the box thinking it held candy. I retraced this phantom thief’s steps. First I found the empty box, then pinpointed the retainer – hanging in a tree! My skills as a storyteller saved the day – and the cost of replacing the retainer. It also made me a hero in my son’s eyes. My crowning glory as a mom. I wrote about my 7-year struggle with anorexia before anyone else in America had ever written a memoir about eating disorders. This was 1979. I was 23. I’d never had therapy for the illness, and I was writing and researching in order to understand what I’d done to myself and why. My other goal was to try to help my parents understand what was strangling my mind during those years when I was obsessed with starving myself. I didn’t know what I was doing as a writer, and I was trying to make sense of behavior that I’d been told for years was senseless. But I knew that many, many others were trapped in the anorexic spiral, and I thought that by candidly sharing my experience, I could help liberate them, too. The book that resulted was Solitaire, and it’s still considered groundbreaking today. My family didn’t thank me. My mother tried to stop me from publishing it, and I don’t think she ever forgave me for going ahead with it. But it has helped thousands of other people over the years. It launched me as a writer. 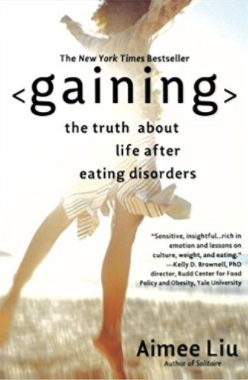 It gave me the foundation to revisit the subject of eating disorders in 2007 with my book Gaining: The Truth About Life After Eating Disorders. And it gave me the courage to find my voice and tell my story without shame or fear. Your problem is your golden opportunity for change. This is a lesson my best friend, the artist Carolyn Hall-Young, taught me, and I repeat it several times every day, especially when the going is rough. Carolyn Hall-Young became my role model in life and in art when we were in high school, and she remained my luminary after she died in 2016, following more than thirty years living with Stage 3 non-Hodgkin lymphoma. Carolyn had a brutally toxic family, but she always found joy and hope in art. Her spirit was light, no matter how heavy her life might be. “Love wins,” she’d declare. “Love always wins!” She had a rich, even effervescent career as an art director, designer, painter, and horsewoman. Her ranch home with her husband in New Mexico was a living gallery filled with color and non-stop creativity. During her last years, when she was bedridden, she created 1600 mobile portraits, which she gave to friends and fans – and some total strangers – all over the world. She won awards that she was too ill to receive in person. Last year, her husband turned her home into a memorial gallery for a weekend in April, and some of those strangers traveled across country to pay tribute and marvel at Carolyn’s life work. Her art and writing covers my walls, and her wisdom and generosity will remain my guiding light forever. As Carolyn would say, you just never know what you’ll get to be grateful for. New York City has forever been my favorite place in the world. I feel most alive there. My spirit quickens as soon as I see the skyline or arrive in Grand Central Station. The whole city vibrates with creativity and expectation. And youth. When I was young I expected to spend my life there. I only stayed two years before meeting my husband and moving to the opposite coast, but it’s still my favorite city, though not far ahead of Paris! This week, I love charcoal pencils. An amazing invention! Clean hands, dark lines. They can produce magical effects. I also adore my WorkFit stationary desk bike. Every day, I pedal for several hours while I read or work on my laptop. It makes me feel so much better than just sitting at my desk! I please. But each sketch is an exercise in discovery and visual meditation. It’s tremendously calming and liberating. Each one like a little trip through the looking glass.